When changes happen to the Catholic Mass, opinions are strong and diverse. Everyone feels in some way that the Mass is theirs. It is. Or is it? Whose Mass is it? And what should people do to claim it? Whether or not adult Catholics attend Mass regularly, they strongly bond with it. Within a single generation, English-speaking Catholics experienced the Second Vatican Council's authorization for the first overhaul of the liturgy in four hundred years, and then, in 2011, they prepared for and implemented a revised vernacular translation. Each of these two events awakened strong feelings--and no small amount of lament from other Christian bodies who share the basic structure and content of the Roman Catholic Mass--as people gradually became aware that someone else's decision was going to affect the cornerstone of their spiritual life. In Whose Mass Is It? Paul Turner examines the impact of the Mass, the connections it makes, and its purpose in the lives of believers. Paul Turner is pastor of St. Anthony Parish in Kansas City, Missouri. A priest of the Diocese of Kansas City-St. Joseph, he holds a doctorate in sacred theology from Sant' Anselmo in Rome. He is a former president of the North American Academy of Liturgy and a member of Societas Liturgica and the Catholic Academy of Liturgy. He serves as a facilitator for the International Commission on English in the Liturgy. His publications include Glory in the Cross and Let Us Pray, both published by Liturgical Press, and he is a contributor to Give Us This Day. Using the question `Whose Mass is it?' Paul Turner uncovers the skein of relationships that give people, from the local sacristan to the curial officials of the Congregation for Divine Worship and Discipline of the Sacraments, a sense of ownership of the Mass. The number of stakeholders is more than most of us imagine, and the relationships between stakeholders are not always easy. Turner invites each stakeholder to recognize the others. He acknowledges the challenges brought on by change, conflicts won and lost, familial tensions heightened-and sometimes resolved-and gifts many and varied shared, neglected, or rejected. With great scholarly erudition and even greater pastoral wisdom, Turner charts a path of mutual recognition that invites each of us to recognize that the liturgy ultimately belongs to Christ, the center who holds both the liturgy and all of us together. "Ideal for liturgical discussion groups, a review for liturgical ministers, a textbook for parish liturgy committees . . . It will surface useful discussions on local issues and practices, clarify harbored misunderstandings, and help promote good parochial liturgy." "What Turner voices in this book captures the mutual relationship between liturgical renewal and liturgical movement. Turner's book challenges us to reflect on the way we value the celebration of the Mass and what energy we invest into the celebration of the Eucharistic liturgy. After reading this book I was challenged to realize that the Mass is meant for the People of God and tells a story of who we are as Catholics." Paul Turner offers us a concise and accessible guide to the post-Vatican II eucharistic liturgy, replete with a great deal of historical information. This book should provide an excellent guide for parish liturgy committees and anyone interested in gaining a fuller understanding of what we do when we come together for Eucharist. "With this book, Turner answers his question definitively: "The Mass does not belong to some idealized past; it belongs to the living church." "At once a history of the liturgical developments of the past fifty years and a comprehensive inventory, justification, and defense of the entities that lay claim to the Mass. 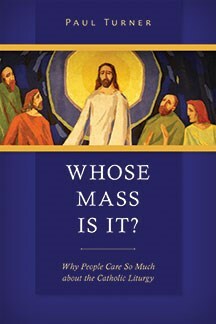 Accessible to those who have little historical knowledge about the Mass while also offering surprising insights and details to those with a deeper understanding." "A valuable tool for priests, staff, and liturgy committee; a good review of what we can do, should do, and should not do."